What Are the Benefits of Udo's Oil? Created by Udo Erasmus, a scientist who has a Ph.D in nutrition, Udo's Oil is liquid oil supplement that has a 2-to-1 ratio of omega-3 fatty acids to omega-6 fatty acids. The numbers might sound highly technical, but this simple ratio can have several notable benefits to your overall health and well-being. For those who can't take fish oil for omega-3s, Udo's Oil is free of fish oil. One tablespoon of Udo's Oil contains 120 calories and 14 grams of fat, of which 1.5 grams are saturated, which is about 8 percent of the daily value for saturated fat. The rest of the fat is unsaturated -- 9 grams polyunsaturated and 3 grams monounsaturated. Unsaturated fats are nutritious because they can help lower cholesterol levels, which decreases your risk of heart disease. Udo's Oil contains 6 grams of omega-3 fatty acids and 3 grams of omega-6 fatty acids. 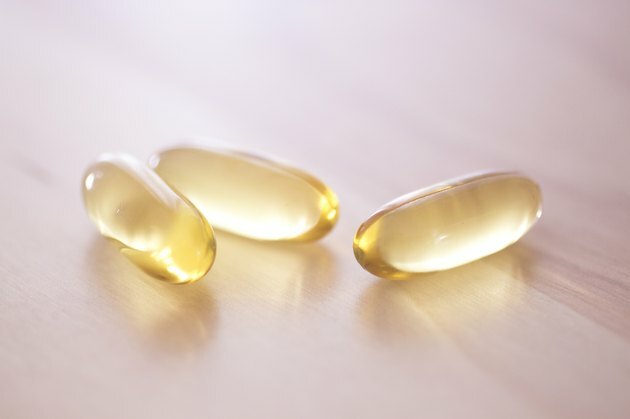 This 2-to-1 ratio of fatty acids is crucial for good health. Diets high in omega-3 fatty acids and lower in omega-6 fatty acids can contribute to a decreased risk of heart disease, autoimmune diseases and certain types of cancer, such as breast and colorectal, according to a 2008 article published in "Experimental Biology and Medicine." The oil also contains 3 grams of omega-9 fatty acids. Omega-9 fatty acids are unsaturated fats that can help lower your levels of unhealthy low-density lipoprotein, the "bad" cholesterol, and raise your high-density lipoprotein, or "good" cholesterol. That, in turn, can lower your risk of heart disease. Your body can't make essential fatty acids on its own, which makes them a crucial part of your daily diet. In addition to reducing the risk of certain health problems, essential fatty acids also help repair your cell membranes, which enables them to absorb the nutrients from the foods you eat. Healthy cell membranes also help remove toxins and waste from your body. In addition, fatty acids help your cells communicate with one another so each of your bodily systems works properly, according to a 2010 article published in "Nature." Always talk to your doctor before adding supplements such as Udo's Oil to your diet to be sure they're right for you and your health history. Udo's Oil isn't meant to replace cooking oil; in fact, it can't be heated or used to fry foods. Instead, Udo's Oil can be taken plain as a nutritional supplement, but you might also drizzle it over cold foods such as tossed and pasta salads.